I've been working on something for ~3 weeks and would love to get your feedback. Invade is a celestial real-time strategy game, which I showed last night at the meetup. So far it's mostly been a one-man project by me with game design input and 3D models from @iceblademush. You can grab the latest build here (which includes small fixes after feedback from everyone last night). 1) Did you have fun with this? Should I continue spending time on it? 2) What should my next step be? Flesh out more levels / put this project on ice / do a proper visual pass / something else. Any and all notes / feedback you have is welcome. I had fun with it. I would really like to right-click and drag to rotate the solar system around (as you do in most games). I think the controls also need a bit of polish because I struggled a bit to figure out what to do. Once I got the hang of it though it was a fun puzzle. My only real complaint is the ice rings around a planet obscure the population markers which should always be on top of any other graphics. I think the game has some legs if you can keep polishing it. @fengol thanks for playing! Saw your notes on itch too, appreciated. You mentioned right-click to rotate. Did you find keyboard rotate frustrating or would just prefer to use mouse only? Also, any reason for right-click rotate preference vs left-click? 2) The tutorial didn't help you grok that multiple clicks would send multiple population dots? Finally, excellent suggestion on planet rings obscuring population markers. Will defn fix for next build. Hey, played a bit, some thoughts are below. [-]The game feels way too slow, 90% of the gameplay is waiting for orbits to allow for colonization/attack to happen. [-]The setting is nice and conquering does produce satisfaction. [-]As Fengol, I also have an issue with how controls are handled, zoom should not change rotation and rotation should be mapped to middle mouse button or one of the other buttons, with mouse xy as an axes. [-]Would be novel if orbits, planet movement and spaceships were true Newtonian. [-]Giving the player something to do while waiting for orbits to align would be good. Hey @critic, thanks for taking it for a spin. On the game feeling slow, I totally agree. Have got similar feedback from other players, so will be attempting to address this in next build. Thanks for validating. This seems linked to your last point of giving the player something to do while waiting for orbits to align. On controls & rotation, from Fengol's and your feedback... will be adding mouse click + drag as rotation to next build too. Finally on physically accurate orbits, it started out this way but there wasn't much opportunity for planets to align or keep the orbits stable for long enough. So I've tried to use accurate physics for other mechanics like the asteroids. I do think there is something in having orbits be more physically accurate than just rotating at a constant speed, so thanks for bringing it to my attention again. Again, really appreciate the feedback, thank you. Yeah, like others said, it's pretty fun invading other planets. On the early levels there are fairly long waits while planets are aligning. This isn't so much the case in later levels. Maybe just having the orbits closer together early on might reduce this frustration. I got to the level where the planets collided and broke. The level after that didn't seem to load. Mechanically this feels very much like Galcon but where the planets orbit. Maybe there is a way to differentiate it further? A suggestion I might make (in order to make the game less like Galcon) is add some abilities, maybe like upgrading planets or building things on the planets (maybe things that make the planets vulnerable by using up population and are best built when the planet is far away from the enemy). Having some things that take a while to upgrade/activate could make use of the wait times between interactions? Thanks for playing @EvanGreenwood. Pity you ran into a bug on later levels, I'll take a look. I hear you, there's a bunch of waiting early on. I'm experimenting with giving players the ability to speed things up at will. Feels less wait-y but also less meditative, so I'm debating that. Good observation on Galcon, Danny mentioned the same to me, I hadn't heard of it before then. Since then I've been trying to expand on the rotation mechanic. 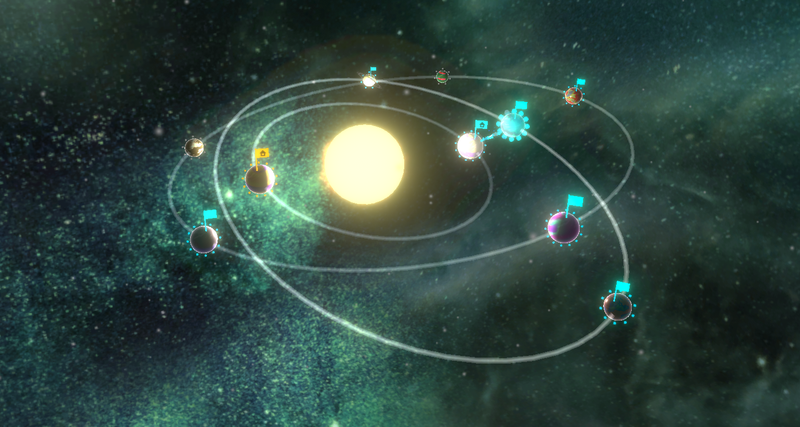 In the build you played, there is a bonus for sending ships/population when planets are close and a penalty when they're barely connected. I'm aware that this isn't clear to players yet, will expand on this in next build and see if it feels more interesting. I love the idea of an action (building / upgrading) which introduces vulnerability! This could be such a nice balance while players are waiting for planets to align. I'll let the idea stew. Thanks for sharing. Hey, played a few levels and off the bat really enjoying this game so far. I like having to think properly about which planets I need to take over next. This game is different from what I'm used to playing. So I personally would love to see more! I agree with @EvanGreenwood with maybe including abilities that would make planets less vulnerable. I personally struggled on level 5 because the system was visually quite big and I had difficulty managing my planets because of its scale, zooming shouldn't really effect rotation as @critic and @fengol have both mentioned. I did have difficulty reading the beginning instructions for level 1 as the GUI to increase planet population was covering the instructions. Some suggestions I have are to maybe include an alert signal to let a player know when a planet is being invaded, it could come in handy when there are more planets added in further levels? Also maybe having starting planets be less vulnerable to invasions? A quick question, would there be any form of multiplayer down the line to play with friends? Fun game. loved the whole invade and 'colonize' planets. Though early game waiting still a bother to me, try to give the players something to do if you still debating on giving the whole 'speed-up' thing. Also, found enemies to be a bit over-powered, as they colonize a whole quicker than the player. As said by @NovaticQueen, maybe include an alert system when a planet is being invaded. And question, would there ever be a form of PvP later down the line for the game? - Like others I missed some of the instruction text. 1. I had some fun playing, but it wore off quickly. Should you continue working on it? That really depends what your goals are. a. Adding visuals increases understanding of how to play the game, or itself is part of the experience, which I don't think is the case for invade. b. You want to practice / learn some art form. Having context to apply art skills to is helpful. I don't think adding levels matters if you can't get enough people enjoying the first couple. I would focus on exploring ways to make the core mechanics more engaging, and then after getting enough positive response from people asking for more, investing time into making more content. In fact I would cull the level count until it's not adding anything new for the player to discover. The amount of time someone plays your game isn't linked to how much fun they had, which I'd argue is far more important. The risk/reward seems to be embedded in the waiting, which is the boring part of the game, because there's no agency. It would be great to move it into the active part. The explicit (unknown) arbitrary distance is playing the gate keeper role in the window of opportunity that essentially narrows the failure state for the player and because it's out of the players control it can quickly become frustrating. I suggest opening up the window to allow sending troops at any time, but have the sun and the orbits effect on the troops path be the opportunity keepers. It will be great to transform the waiting to be a strategic maneuver instead of a forced rule. I think It would be awesome to be able to see troops go into the sun! That would certainly help tick promotion / trailer box. I'd like to effect the enemies opportunities more, maybe by effecting the orbit? Hey @NovaticQueen, thanks for trying it out. Warms my heart to hear you enjoyed it! "I personally struggled on level 5 because the system was visually quite big and I had difficulty managing my planets because of its scale, zooming shouldn't really effect rotation as @critic and @fengol have both mentioned. " I did have difficulty reading the beginning instructions for level 1 as the GUI to increase planet population was covering the instructions. Gosh, that's an amateur mistake on my part, will fix. Thanks for pointing it out. I've thought about alerts for a while and am cautious of adding too much visual noise. Was there a specific moment while playing where you felt you wanted an alert? Also maybe having starting planets be less vulnerable to invasions? Interesting idea, I'll let that stew. Did you feel like your home planet was being Invaded often? or just wanted it to feel a bit stronger? PS You mentioned it's different from things you usually play. I'm curious... what do you usually play? @VoxlRampnt thanks a heap for trying. You re-iterated being bothered with waiting. That's definitely the biggest issue with the game in it's current state, focusing on that now. There will be a "speed up" button in the next build for people to try. found enemies to be a bit over-powered, as they colonize a whole quicker than the player. Great observation. The enemy AI is quite simplistic right now. So on some level's it's feeble and on others it's scary good. Ultimately I'd like to have the difficult ramp slowly and dynamically adjust itself to challenge whoever it's playing. alert system when a planet is being invaded. I'm interested to hear your answer too: Was there a specific moment while playing where you felt you wanted an alert? To your question on PvP, definitely! The first prototype had multiplayer, it was pretty fun and I'd love to bring that back in later on, once the core mechanics feel more solid and refined. Hey @Pomb, thanks for giving Invade a spin. You've given really insightful feedback, and I'm a game design fledgeling, so will take me a while to digest. Point taken. The focus is on making gameplay feel fun and satisfying right now. This is really interesting to me. You mentioned you reached level 5 and I've seen people have most fun at level 7. So I'm keen to cull levels and get to the more exciting ones faster. I reckon I got carried away with how cool my level editor is and wanted to demonstrate the possibilities. Way more effective to have fewer, funner levels. Totally agree with you on fun > playtime. You've raised a few things here in a way I've never thought about them before. So I'm going to let it all sink in. Thanks again for such taking the time to type that up and answer my opening questions so directly. The setting and graphics of the game was a really enjoyable experience thank you for allowing me to test it out for you I had a lot of fun although I did get a little confused on the second level as I wasn't sure what to do and after around 15 minutes I managed to beat it and only when I replayed it did I realise that the goal was to max out the populations on the planets as there was no clear indication to what the objective was. I did notice that you can use the keyboard to move the camera around but found it a lot easier just to use the mouse to drag to rotate the solar system. To me, the overall controls felt a little sluggish but worked fine once I got used to it (I would add something into the options to help with this). Once I was able to get all the key game mechanics down it became a lot easier to play but the bots really don't give much of an easy go (which to be honest is a good thing as it keeps you on your feet). My only real complaints would with the camera controls mostly being the zoom and rotation as it is a bit of an issue when panning around some of the maps. I ended up just going for a top-down-ish view just so I was able to see each of the planets when they were in the range of population/invasion. •	The lack of a pause button as there are times when I was like "hey let me just go and check something" and had to either escape the level or start a new one. •	The early game is a little slow (although the space bar does help the game a lot in the sense of speeding up) If you miss that planet coming towards you then you got to wait until the orbits are back and within range of colonization/attack. (Personally, I would give the player something to do in the meantime while they wait for orbs to align themselves again). •	The early levels, there are fairly long waits while planets are aligning. This isn't so much the case in later levels. Maybe just having the orbits closer together early on might reduce this frustration. I was able to get through all 13 levels and the Final although took some time as some levels are harder than others but overall a great and enjoyable game to play. To be honest, the game is solid just requires a little bit of fine tuning here and there and it should be well on its way. You've raised a few things which came up in previous comments, so that's useful for me to reiterate those. The lack of a pause button as there are times when I was like "hey let me just go and check something" and had to either escape the level or start a new one. Great point. I'll make sure you can pause during the next build. The concept of planets colliding and breaking is a fantastic concept and great mechanic. A suggestion I might make would be that you can have a sort of event or ability that can destroy a specific planet that you don't want to be captured or like create a sort of event that causes planets to either get pulled towards the sun or like thrown off into the cosmos. Finally I like the ideas on timed events (because it ties into the existing timing mechanics). The finale black hole level has some of this and I'm keen to explore it further. Thanks again for the post and for all the constructive feedback.